I started the chain with the word, "shelter." As a teenager I wanted to represent how kids my age portray shelter. Upon further research, this idea twisted into a darker, more gloomy concept. 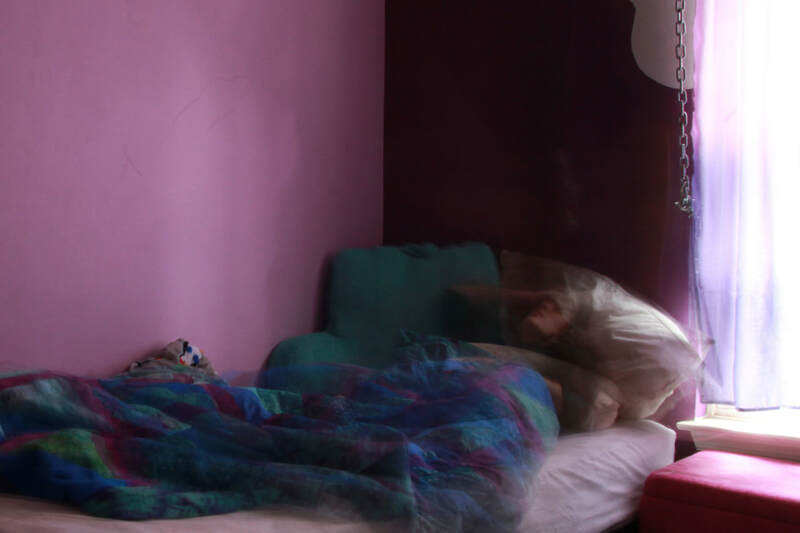 The girl in the photograph appears to be sheltered from the outside world as she lies in her bed restless. The colors and the movement add to the mood that connect to people that suffer from anxiety, depression, and insomnia. When I passed this photo on, I envisioned that the group would discuss the troubles teenagers with mental illnesses face on a daily basis. Our song was inspired by the photograph. When we looked at the piece, we saw loneliness, isolation, emptiness, and loss. While composing the piece, we went for a minimalistic style, thinking about how the focal point should shift throughout. Given what we had, we composed a somber love song with a theme of abandonment and distance. This piece is representative of the girl in the photo: alone, hiding, lost, detached and isolated. ~Peter A., Aspen F., Eliza P., Giovani A. When we listened to Strand 6, we immediately thought of vulnerability and loss. These feelings helped us focus on themes relating to sleep paralysis, death, emptiness, and lost love. We really wanted to combine the idea of using the string of fate, which is influenced from Asian cultures, with the idea of sleep paralysis, which was a common theme that artists represented in their artwork during the period of Romanticism. Though a physical string is not present in our image, we connected our figures physically and visually with a painted V shaped white line, and overlapped a strand of the females hair over the man’s. 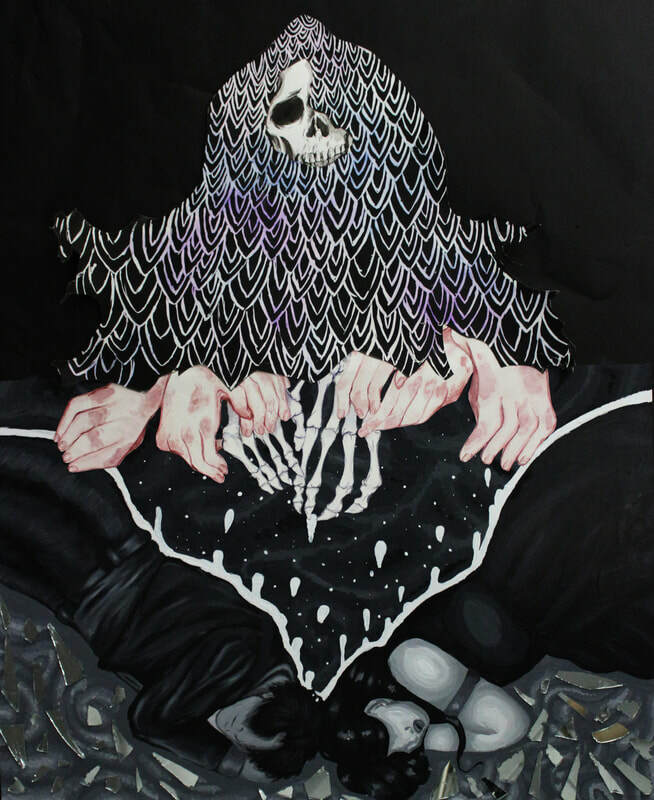 The white border dripping upwards toward the black hooded skeleton represents death because in many Asian cultures white is associated with those who have died. Most importantly, we wanted the viewer to feel connected with this piece so we attached shards of broken mirrors under the two painted figures. The pieces of mirror are suppose to force the viewer to confront their emotions when seeing their own reflection. We intended for the viewer to feel connected to this piece by experiencing the intense emotional feelings of loneliness and loss conveyed through the use of dark colors, choice of figures, and compositional arrangement. ~Kristel B. and Aubrey C.
When we received the dance, we felt a theme a power or the over powering of someone. Some of our first reactions were to have one person taking control of another person. But, as we discussed ideas for our scene, the idea of a dystopian society came up. As we expanded on this concept, the “restrictions” we made for our society was that there was no type of self expression, including art and clothing. We thought this was fitting to the theme for the showcase as a whole, as the art of being human is to make art in general. We wanted to leave the ending unresolved because that is how we felt the dance ended, uncertain and incomplete as that is how life would be without art. ​~Ella S. and Taylor W.
~Barabara S., Corrine O., Kristen P., Ben W., and Darby C.